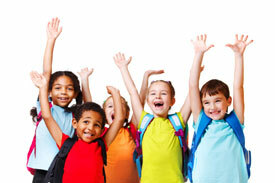 Is your child's backpack causing poor health? Fall is approaching, which means the new school year is here. During this time of year your Rancho Cucamonga chiropractor wants to make you aware of one of the most common causes of injury and dysfunction in a child’s spine: a heavy backpack. At Abundant Life Chiropractic in Rancho Cucamonga we see more and more children coming in with posture-related issues as a result of carrying heavy loads in their backpacks. It has been shown that an increased load on a child’s spine can cause a decrease in disc height, abnormal spinal curvature, and can aggravate a child’s condition if they have scoliosis. Other issues which generally are not common in children, such as muscle fatigue in the neck and shoulders have also been on the rise. Luckily, your Rancho Cucamonga chiropractor has some tips that can minimize the effects of a heavy backpack. Before loading your child’s backpack with books, first ask their teacher or school if it is possible to have two copies of books, leaving one copy at home and one at school to minimize the need for carrying them back and forth. Make sure to eliminate any unnecessary items in their backpack as well, such as extra folders and books that will not be used that day. As a rule of thumb your child’s backpack should not weigh more than 10-15% of their own body weight. Another common way that kids increase their chance of problems is by wearing their backpack over one shoulder. Wearing the straps over both shoulders will allow the weight to be evenly distributed over the spine and help minimize extra weight on one side. Finally, the best solution to spinal problems due to heavy backpacks is by switching to a backpack with wheels that your child can simply roll around school, completely removing excess stress on the spine. At Abundant Life Chiropractic in Rancho Cucamonga we are dedicated to your family’s health and a major part of that is keeping your spine and nervous system healthy. To schedule a spinal checkup for you and your family contact us at Abundant Life Chiropractic.